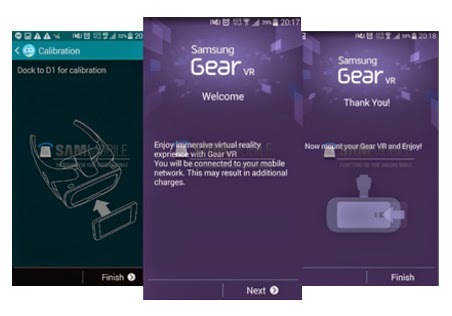 Called Gear VR Manager, it will connect the VR Gear to a mobile device and manage its functionality as well as offered on Samsung Apps. According to published information, Samsung has developed various database apps, including VR Panorama, VR Cinema and HMT Manager. It has many features: an alert function to notify each hour spent in virtual reality, the possibility of installing a security lock or an alarm when the device is detached and a guide to reconnect. It will integrate touchpad and a back button located on the right side of the headset, allowing the user to control, navigate the user interface or smartphone to see the real world through the sensor of the camera. Apps can also be launched vocally. We believe that Samsung will offer a development kit Gear VR after its presentation at IFA, from September 5 to 10.